OBJECTIVES: To develop a dynamic prediction model for high blood pressure at the age of 9-10 years that could be applied at any age between birth and the age of 6 years in community-based child healthcare. 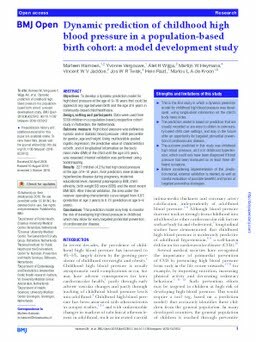 DESIGN, SETTING AND PARTICIPANTS: Data were used from 5359 children in a population-based prospective cohort study in Rotterdam, the Netherlands. OUTCOME MEASURE: High blood pressure was defined as systolic and/or diastolic blood pressure ≥95th percentile for gender, age and height. Using multivariable pooled logistic regression, the predictive value of characteristics at birth, and of longitudinal information on the body mass index (BMI) of the child until the age of 6 years, was assessed. Internal validation was performed using bootstrapping. RESULTS: 227 children (4.2%) had high blood pressure at the age of 9-10 years. Final predictors were maternal hypertensive disease during pregnancy, maternal educational level, maternal prepregnancy BMI, child ethnicity, birth weight SD score (SDS) and the most recent BMI SDS. After internal validation, the area under the receiver operating characteristic curve ranged from 0.65 (prediction at age 3 years) to 0.73 (prediction at age 5-6 years). CONCLUSIONS: This prediction model may help to monitor the risk of developing high blood pressure in childhood which may allow for early targeted primordial prevention of cardiovascular disease.